This product requires the base game Crusader Kings II. Europe is in turmoil. The land has been fragmented into petty fiefdoms. The Emperor is struggling with the Pope. The Holy Father declares that all who go to liberate the Holy Land will be freed of their sins. Crusader Kings II: The Old Gods is the fourth expansion for the critically praised strategy/RPG. Finally play as a Pagan or Zoroastrian ruler, with particular focus on the dreaded Vikings. 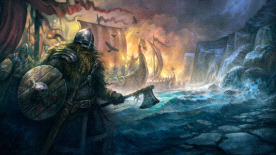 Pillage and adventure according to true Viking tradition! Loot and pillage provinces. Burn down cities and take their gold! Sacrifice to Odin at the great Blot! © 2013 Paradox Interactive™. Trademarks belong to their respective owners. All rights reserved. Crusader Kings II is required to play this DLC.